California's epic drought has brought water issues to the forefront of our state's collective conscience yet again. However, there is something different this time around: it all seems so much more urgent. Have we finally reached a tipping point in our attitude towards water that requires a sea change in perspective? Such change may be required to avert an otherwise be a slow, painful decline into persistent freshwater scarcity statewide. Perhaps it's the record setting lows in snowpack, streamflow, soil moisture and reservoir levels. Or maybe it's that the Central Valley Project and State Water Project allocations have been slashed to zero for first time ever. It could be the massive run on our dwindling groundwater reserves that will inevitably ensue when our farmers open their taps and nothing comes out. 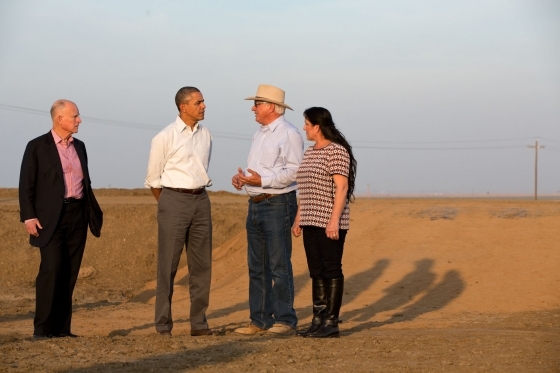 California's water future looks fairly bleak on its present course. Climate change, population growth, multiple competing demands and the lack of a holistic surface and groundwater management strategy have conspired to drastically change our state's water landscape. There is no longer enough water for us to do all the things that we want to do, nor is it likely that there ever will be again. 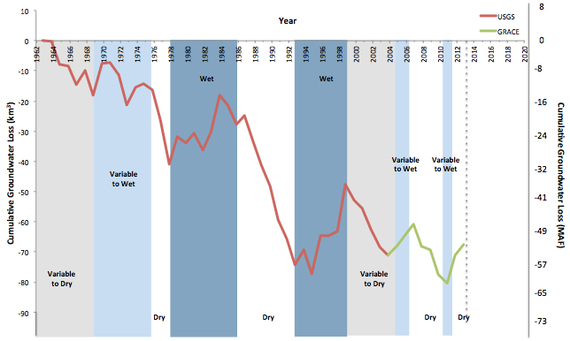 The traditional cycle of drought and groundwater depletion, followed by only partial recovery of our aquifers in wet periods, is driving our water tables to historically-low levels. Decades of water loss and land subsidence in the Central Valley threaten to undermine the state's agricultural productivity, and have wreaked havoc on regional ecology and civil infrastructure. In a state that relies on groundwater for nearly two-thirds of its water supply during drought, this is a frightening truth that must confronted head on. Cumulative groundwater depletion in California's Central Valley since 1962. Figure produced by our research team at the UC Center for Hydrologic Modeling following USGS Professional Paper 1766 and updated with our NASA-GRACE based estimates of groundwater storage changes since 2003. While the relative merits of several important water plans are being actively written and debated, it is abundantly clear that the key to making any of them a success is that we must change the way we view water in California. We can no longer afford the luxury of politicizing such a critical, shared resource as water. We must steer the conversation away from Man vs. Smelt towards acknowledging the competing water needs for food and energy production, for the environment, for domestic use and for economic growth. We all need to eat, to turn on the lights, to go to work and to preserve a clean, healthy environment. We must treat and price water as the precious commodity that it truly is. That means conserve, reuse, recycle, and then do it all over again. Enhanced conservation and efficiency is cheap, easy, and incredibly effective. Governor Brown's request that we reduce personal water use by 20 percent is an easily achievable goal and we must work together to achieve it. Even more savings can be realized in agriculture, by far our largest investment of water resources, and in outdoor water use at home. Perennial orchard crops, flood-irrigation and our front lawns are all literally sucking us dry. What may have seemed reasonable in the past may simply no longer make sense today. Monitoring and managing groundwater is critical for long-term sustainability and for the state's economic and environmental health. Groundwater withdrawals must be measured and reported. Local and regional standards should be set and enforced. Without monitoring, there is no management. It's time for us to change the way we think about water in California. The Golden Age of water in the Golden State is history. A sustainable water future requires a new state altogether: a new state of mind. If we align our thinking, our policies and our vast technological expertise accordingly, we may not be able to squeeze water from a stone. But with the right shift in perspective, lifestyle changes and management strategies, we can still live pretty comfortably with what we have.